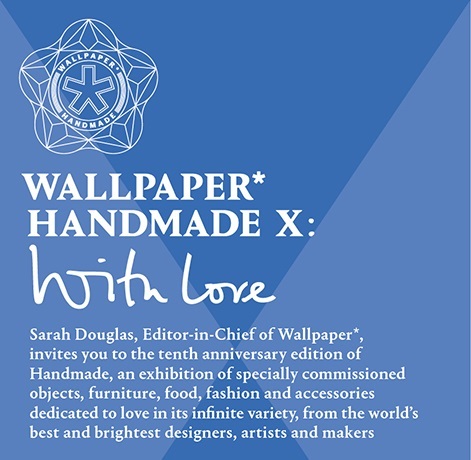 Wallpaper* Handmade, hosted at the elegant Milan’s Salone dei Tessuti, turns 10 and explores love in its infinite variety. 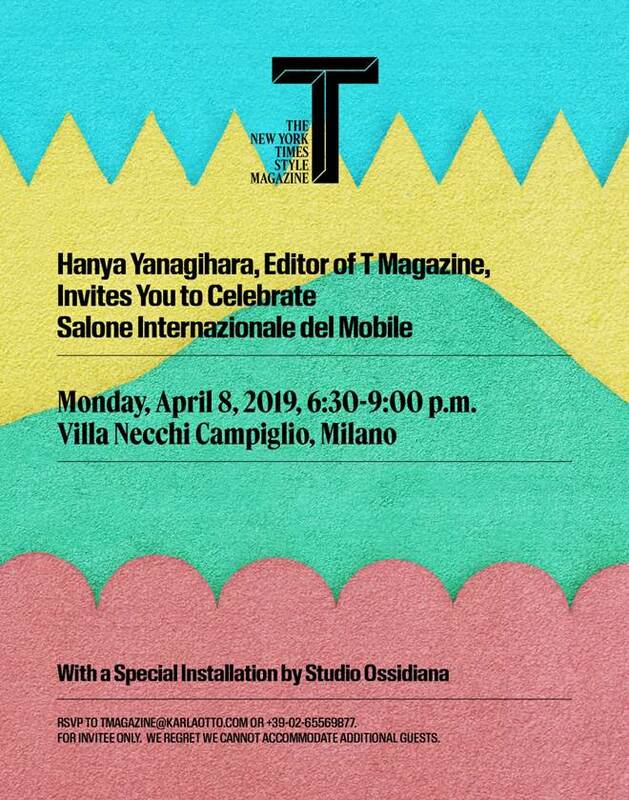 T’s annual Salone del Mobile celebration has turned the garden of Villa Necchi Campiglio in Milan into a fantastical landscape created by the design duo Studio Ossidiana – Alessandra Covini and Giovanni Bellotti. T’s editor in chief, Hanya Yanagihara, had invited the designers to bring the inventiveness of their recent Prix de Rome-winning project — in which they reimagined the Sixhaven area of Amsterdam as a floating playground — to the party (a model of that design was also on display inside the villa). While guests included Olafur Eliasson, Raf Simons, Jonathan Anderson and India Mahdavi, the stars of the evening were undoubtedly the 12 pastel-painted piñatas, shaped like abstract plants and otherworldly farm buildings and filled with chocolates; petals from the Milanese florist Potafiori and surprise gifts. 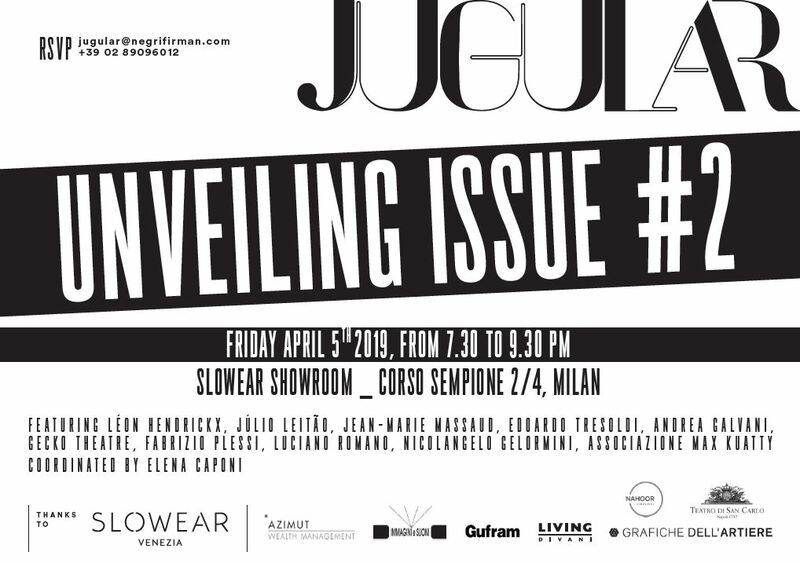 In conjunction with Milan's Design Week and the release of Issue#2, JUGULAR presents itself together with the artists who have contributed to this latest exciting adventure. Held in between Miart and Salone del Mobile, the launch event will be a three-dimensional and contemporary representation of the topics covered in Issue #2, through special installations dedicated to some of the personalities that have accompanied us during this fantastic journey; Jean-Marie Massaud, Arko Datto, Léon Hendrickx, Edoardo Tresoldi, Andrea Galvani, Júlio Leitão, Nicolangelo Gelormini, to name a few. 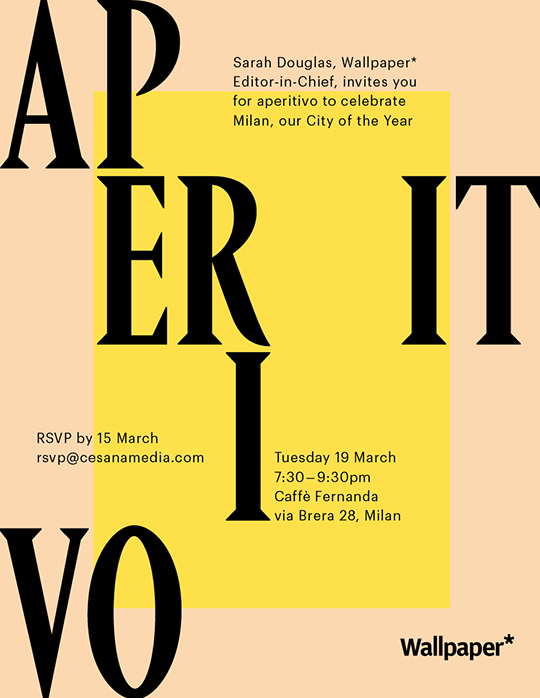 Sarah Douglas, Wallpaper* Editor-in-Chief, invited for an “aperitivo” clients and friends to celebrate Milan, nominated City of the Year by 2019 Wallpaper* Awards. The cocktail took place at Caffé Fernanda, within Brera Pinacoteca, recently redesigned and launched for the visitors of the art gallery and any customer who appreciates the special place. Caffè Fernanda, named for Fernanda Wittgens, the gallery’s erstwhile director responsible for rebuilding the institution following its bombing in the Second World War, serves up coffee, cakes and evening aperitivo to the gallery-goers and art students that populate the institution’s hallowed halls. The annual Culture issue, which drops April 14 is unlike anything T has ever done. The theme is America in 2024. 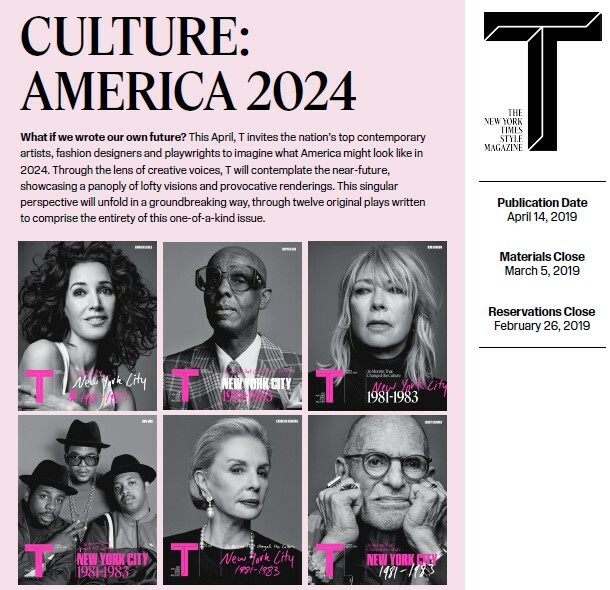 T has invited artists, fashion designers and playwrights to write original plays about what they imagine America to look like in 2024. The issue will read like a book, comprising of ~10 plays. The issue will have a series of covers featuring celebrities cast in the plays. A group of emerging and established playwrights will be writing short, original plays about what they envision for America in 2024. These plays--written exclusively for T and published in their entirety in print and online--will be performed at a one-night-only event in New York City. Natural, intimate, and paired down, performers will do read-throughs of the plays, offering attendees a peek behind the curtain of what goes into creating original works of art. 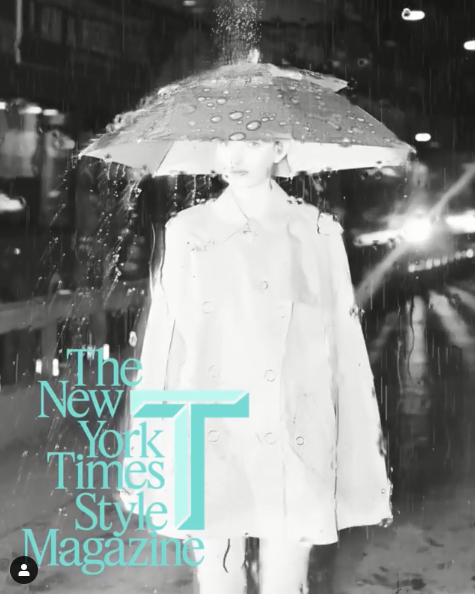 T: The New York Times Style Magazine was just nominated for three ASME's, National Magazine Awards, the most nominations in its history! T: The New York Times Style Magazine was nominated in three categories — in the Single-Topic Issue category for “New York City: 1981-1983,” “General Excellence - Service and Lifestyle” and “Design and Photography - Service and Lifestyle”. Cesanamedia has started a collaboration with Looping Group, a highly innovative Brand-Publishing House. Looping Group is a collective of the best storytellers, editors, visual artists, filmmakers, strategists and data scientists who designed and realized the two publications reaching the exclusive Mercedes-Benz community. They design and realize the two exclusive publications She's Mercedes and Circle. She's Mercedes, published twice a year, with a circulation of 190thousand copies, is the glossy magazine for “women who choose to lead”. It is an international polyglot forum, geared towards the lives and needs of a new generation of women. She’s gives women a voice, so that they are able talk about their visions, their defeats, their successes. 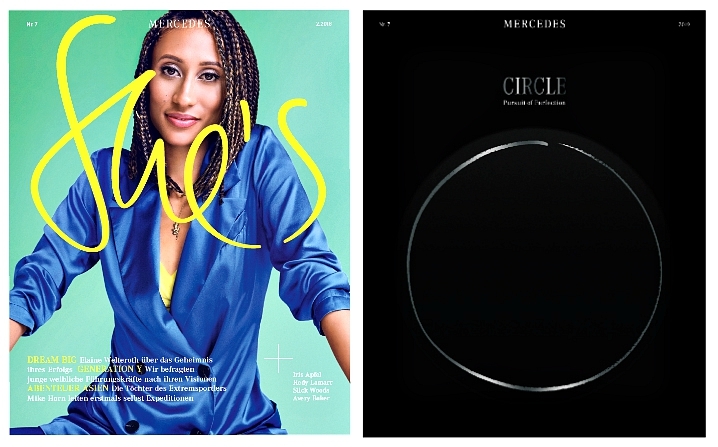 Circle, The “Mercedes-Benz Circle of Excellence” publication has been recently relaunched by Looping Group. It targets the top customers of Mercedes-Benz – an exclusive, but continuously growing network of a lively community. Wallpaper*, the international design, fashion and lifestyle bible, has published its annual Design Awards issue. 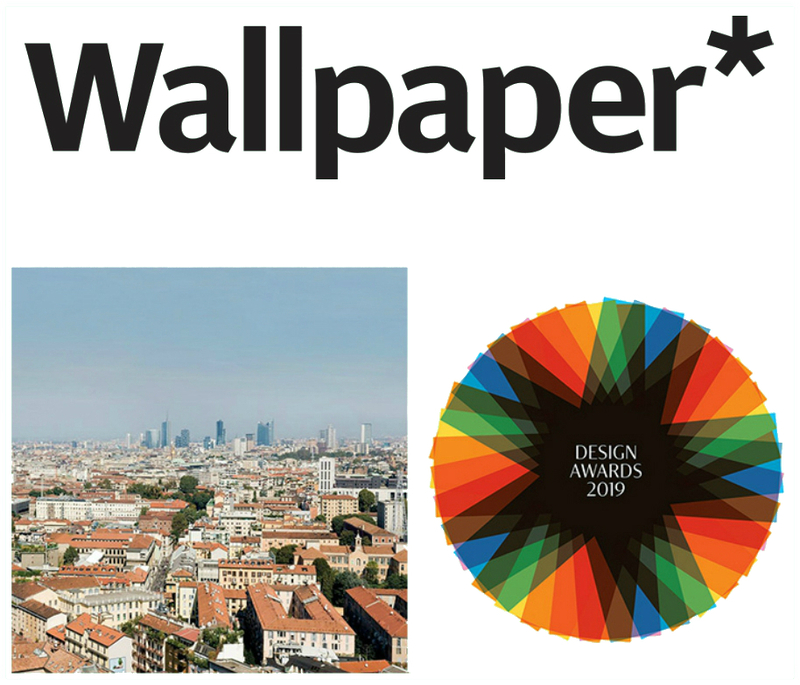 Now in their 15th year, the Wallpaper* Design Awards laud and applaud the world’s most pulse-raising and life-enhancing places, products, people and phenomena. Milan is saluted as Best City. Milan has experienced an exciting renaissance: new additions and developments over the past year have seen the cityscape evolve to combine its traditional grandeur with a contemporary architectural language. The media portfolio of Swiss media company Admeira has been reshaped. 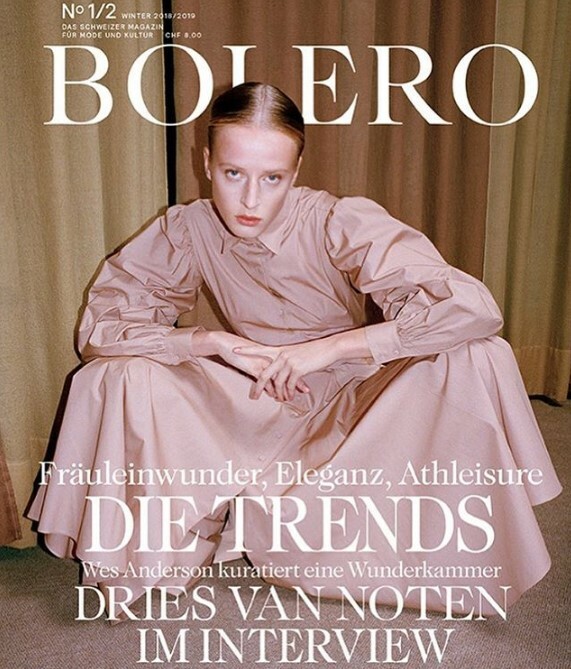 The leading luxury magazine Bolero will be enclosed with the business journals Bilanz and Handelszeitung six times a year. Bolero, which will take the place of the existing lifestyle supplement Icon, will keep discerning readers informed about topics from the worlds of culture, lifestyle and fashion. This will expand the circulation of Bolero, and its reach among business- and lifestyle-oriented readers will increase accordingly. The T magazine that comes with Le Temps appears 20 times a year. 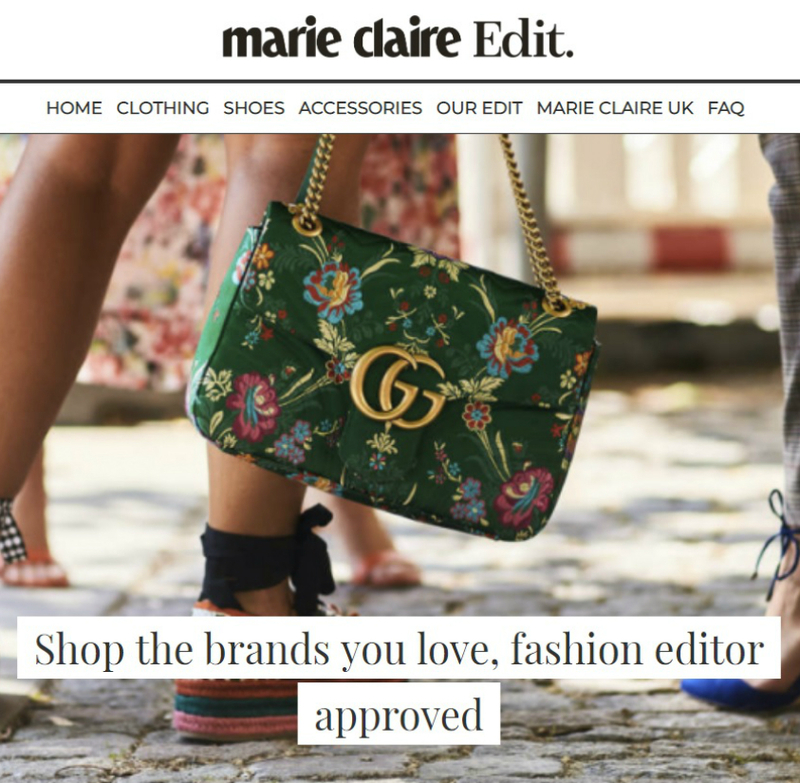 Six special editions will appear in which the themes covered up to now by the French edition of Bolero – fashion, beauty, jewellery and luxury – will be given a particularly strong weighting. Thus Bolero and «T» will together provide a new, national offering for an attractive target audience. Bolero Men and the French-language edition of Bolero will be discontinued as of the end of 2018.